The Special Consensus (USA), who head the bill at the 18th Athy Bluegrass Festival at Athy, Co. Kildare, Ireland, this weekend (10-13 July) will conclude their current European tour at the Scottish Bluegrass Association's 22nd Guildtown Bluegrass Festival at Guildtown, Perthshire, Scotland, from Friday 18 to Sunday 20 July. Other bands at Guildtown will include Country Cocktail (CZ). Full details are on the SBA website. 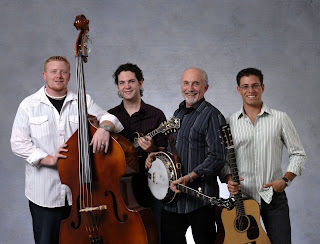 The Special C., which played last weekend at the 20th International Bluegrass Music & Dance Festival in Conwy, north Wales, together with Bononia Grass (I), will also be giving a full interactive bluegrass workshop in Bathgate, Scotland, on 16 July.